Video talks like Ted Talks have popularized the art of public speaking. Today, giving a speech isn't a boring task reserved for congressman and C.E.O.'s. But instead, speaking is a medium people all over the world are using to communicate new ideas, gain sales, and knowledge. But if you don't have a lot of experience with public speaking, then it can be quite intimidating. Read on for ten tips to help you get started so that you can share your unique ideas and experiences with the world. Before you speak in front of other people, you need to be very confident in what you have to say. Make sure you take the time to do thorough research and find all possible angles on your topic so that you won't be blindsided during the Q and A section if there is one. When you speak in front of an audience, you don't want to fumble your way through what you are trying to say. Try to have a structure for your speech that leads your audience through the topic. Introduce your audience to what you want them to know. Provide details on the topic. Summarize what you told them. Add a call to action in conclusion, especially if you're wanting your audience to do something. By using this structure, you will also be less likely to forget parts of your speech since it will all build up to your final conclusion. There is no one right way to do anything. When you are speaking in public, your only goal is to get your message across to your audience. So do whatever is necessary to make that happen. Try practicing different ways of speaking. Write a couple different ways to start your speech and decide which is best by performing in front of a couple of your closest friends. Recording your presentation as audio or video really helps, too. You should also play with the speed at which you talk, what you decide to wear, and how long you choose to continue speaking. You'll also want to add vocal variety at certain points in your talk for emphasis. Always have a hard copy backup of your outline, if you are depending on a PowerPoint to prompt you through your talk. Technology is not always dependable. You want to feel confident during your presentation. When you are speaking to a crowd, you need to tailor your word choice to their needs. For example, if you were speaking to a crowd of sailors from Ireland, you could choose to use analogies that have to do with sailing and Ireland in your speech. While you don't have to take this tip to the extreme, a few references here and there will help you connect to your audience better and maintain their attention through the entirety of their speech. You'll also want to make sure your analogies or metaphors are not lost because your audience is not familiar with the concept or offended culturally by the idea. If you think that you are going to fail at public speaking, then it is much more likely to happen. You need to see yourself being successful before it can happen. Try to conjure a mental image of yourself getting through your speech well and hold on to that vision while you deliver it. An actual reward for a job well done won't hurt either. When you are speaking in public, you will most likely be talking to an audience of people of different ages, backgrounds, and hearing abilities. To ensure they all get the most out of your message, you need to talk as slowly as seems normal. You also want to speak loud enough to reach all the audience in the room. Don't use abbreviations or acronyms unless you are sure all your audience understands their meaning. When you are having a conversation with someone, do you often feel like you have to rush through your sentences before they interrupt you? But when you are speaking in public, the people have already chosen to spend their time listening to what you have to say. Know that your words have value and represent that by delivering them slowly and with care. When you are up on stage, you shouldn't be reading off of slides or notecards. You need to be able to engage with the audience. Try to make eye contact with as many different people as you can while you are speaking. Pretend like you are having a one on one discussion with those people. Looking at them individually around the room helps. That kind of engagement will let the audience know that your points are important and relevant to them. Public speaking is the kind of thing that gets a lot easier with practice. Take every opportunity you can get to speak in public if you want to get really good at it. That's the best way to move forward with your career. You can always consider participating in a local Toastmasters International club like Wordspinners. They meet the first and third Thursday of the month from 6:45 - 8:00 p.m. There are 16 Toastmasters International clubs around Chattanooga, TN alone! The clubs meet at different times and locations. See if there is one in your area. You'll have the chance to give your presentation, gain speech evaluations, achieve recognition and grow your leadership skills through Toastmasters International. One option is to start speaking at your church or going to open mic poetry and comedy nights in your city. Getting up in front of a low-pressure supportive crowd can help you gain confidence in your ability to appeal to the masses. You're never going to appeal to every member of a crowd, so don't sweat it if a few people seem disinterested. Focus on the people in the crowd who seem to be enthralled by what you are saying. Make eye contact with them and gain strength from their interest. Not everyone who enters the room you are speaking in will need to hear what you have to say, but as long as you impact just one person in the right way, you have had a positive effect that day. When your audience claps for you at the end of your speech, that is their way of thanking you for the information that you shared with them. It's only polite that you share your gratitude in return. While some speakers join in the applause themselves as a way to respond to the audience, it's more appropriate to verbally thank your audience. Let them know you appreciate their time for coming out to see you. 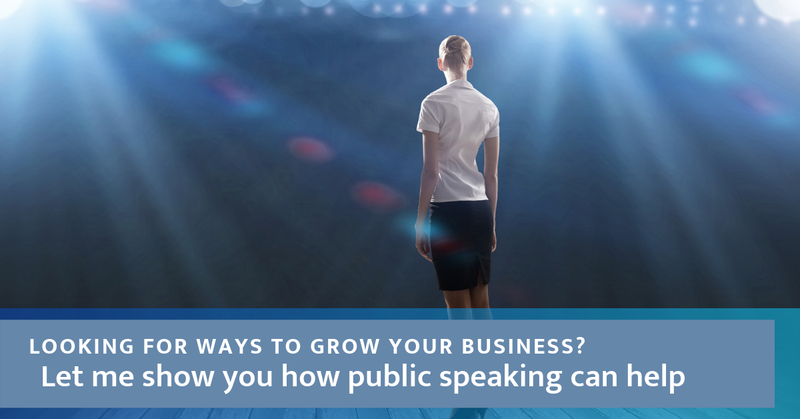 Now that you have these tips, you will master the art of public speaking in no time. Just remember to be confident and speak your ideas with conviction. Who knows, you might land a paid speaking gig with some serious practice sharing your expertise. For more helpful advice for entrepreneurs, check out our other blog posts today.